Samsung will be showing off a rather special camera at CES this year. The Samsung SH100 not only features WiFi for sharing your pictures with other Wi-Fi enabled devices, it’ll also hook up to your Samsung Galaxy S smartphone for some rather sophisticated trickery. Using Wi-Fi, the SH100 can connect to your Galaxy S, which will then act as a remote view finder for your camera, showing you on the phone’s display exactly what the camera is seeing. You can then take a shot from a button on the phone rather than by physically pressing the camera’s button, giving you a unique remote camera facility. The applications of this are huge and it makes you wonder why it’s not been done before! as for spy shots…well, I’ll leave that to your imagination! In addition to the remote viewfinder facility, the Samsung SH100 also uses DLNA so you can see your pictures on a DLNA-equipped TV just by selecting them on the camera’s screen and beaming them to the TV (I do this with my HTC Desire HD’s pics, and its a fantastic way to see the pics you’ve taken). You can even back up your pics over WiFi or send them to Facebook, Picasa, YouTube or Photo Bucket. Oh, and as for the camera itself, it’s actually quite good as well! It’s a 14.2 megapixel camera with an f4.7 – 23.55mm lens, 5x optical zoom, 3″ LCD screen and is capable of capturing video at 720p! 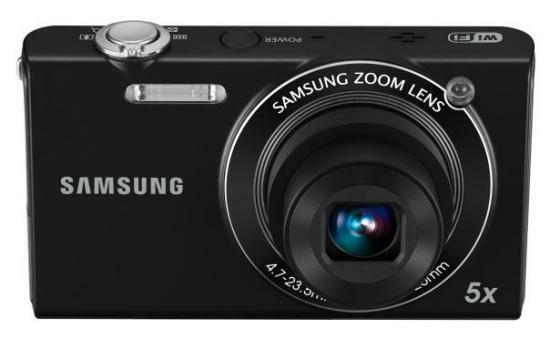 Samsung have really pushed cameras into a new dimension with the SH100. The combination of WiFi, DLNA and integration with smartphones not only makes the camera more versatile, it should increase the range of unique photos you can take with very inexpensive technology – and that’s never a bad thing!